White rice is the most consumed food by Indonesian people. However, carbohydrate levels in white rice are included in the high glycemic index (73). This makes the white rice less healthy, especially for people with Diabetes Mellitus (DM). Appropriate processing is done to lower carbohydrate and glucose levels in white rice to be more safe to eat, on the contrary is roasting and burning. The purpose of this study was to analyzed the influence and grilling of white rice on carbohydrate, glucose and white rice test after treatment. The research method used was analytic with experimental design (pre-experimental). Sample of acceptance test research from 25 people with DM in Clinic dr. Suherman University of Muhammadiyah Jember. Friedman Test and Wilcoxon Sign Rank Test was used to analyzed, glucose level and analysis used One Way Anova and Post Hoc (Tukey HSD) Test with 5% confidence level (α = 0,05). The results showed that the average of normal rice sugar, grilled rice, and baked rice (X0, X1, and X2) were 39,44%; 34.84%; and 37.45%. Medium for the average glucose levels (X0, X1, and X2) was 2.07%; 2.86%; and 3.38%. The results were performed to measured energy, aroma and texture, white rice (p <α value). Grilled rice had low carbohydrate levels and could be accessed by diabetes, 72.38 grams of grilled rice (25.22 g of carbohydrates and 2.07 g of glucose) could be consumed 1-3 times a day. MUKTI, Kana Satria; ROHMAWATI, Ninna; SULISTIYANI, S.. ANALISIS KANDUNGAN KARBOHIDRAT, GLUKOSA, DAN UJI DAYA TERIMA PADA NASI BAKAR, NASI PANGGANG, DAN NASI BIASA. 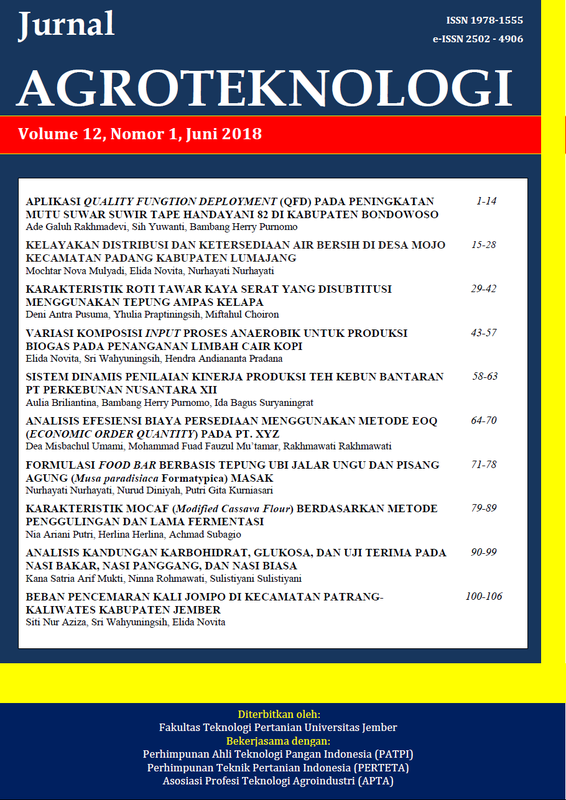 JURNAL AGROTEKNOLOGI, [S.l. ], v. 12, n. 01, p. 90-99, june 2018. ISSN 2502-4906. Available at: <https://jurnal.unej.ac.id/index.php/JAGT/article/view/8333>. Date accessed: 18 apr. 2019. doi: https://doi.org/10.19184/j-agt.v12i1.8333.